Festivalgoers came to the Tribeca Film Festival's panel on The Protectors - a VR documentary on park rangers engaged in warfare against poachers and extremists in the Democratic Republic of Congo - expecting Oscar-winning director Kathryn Bigelow (TheHurt Locker) and Emmy-nominated filmmaker Imraan Ismail (The Displaced) to discuss the film. No one, myself included, expected Hillary Clinton to join them on stage. In honour of Earth Day, Clinton crashed the panel on Here Be Dragons' latest 360-degree film unannounced to startled cheers from the crowd. The former Secretary of State praised The Protectors for accurately portraying "what we're really up against in the global effort to protect elephants," and described how African war regimes have been fuelled by ivory profits from the mass slaughter of elephants. About 100 elephants per day or 35,000 per year are killed by poachers. Here Be Dragons, formerly Vrse.works, a VR production studio with four Emmy nominations under its belt, produced The Protectors for the Within platform which you can download for free on all the main platforms: iPhone, Android, Gear VR, PlayStation VR, Oculus Rift and HTC Vive. While the studio has made similar documentary films for organizations like the United Nations and the New York Times, it has also created tie-in VR experiences for Ghost in the Shell, Mr. Robot and other major Hollywood properties. Along with The Protectors, with the Nat Geo Channel, Here Be Dragons (HBD) produced three other VR films for Tribeca's virtual arcade - Tree, The Possible, and The Last Goodbye, all available for Tribeca passholders in New York until 29 April. Looking at the whole slate, HBD is bringing both VR storytelling and activism into the public eye. Before Clinton's surprise appearance at the panel, we were each given our own Samsung Gear VR headset to watched the ten-minute film as a group. 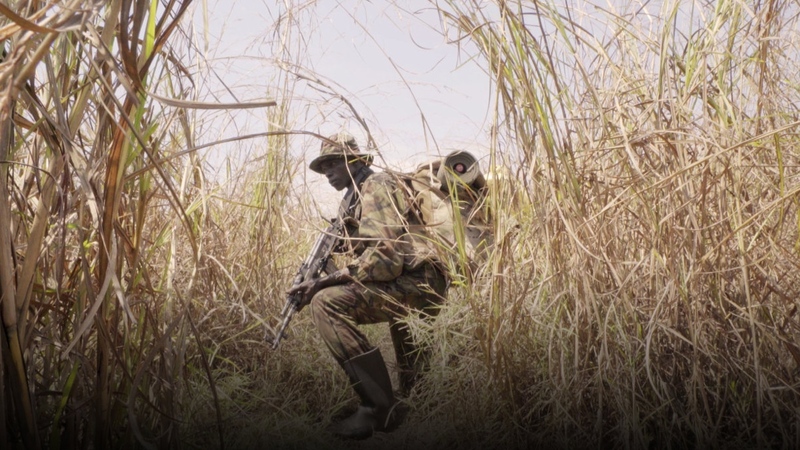 It showed Garamba National Park rangers marching alongside elephant herds, stalking after poachers, and engaging in firefights. "The challenges, threats and dangers the rangers are facing each day are almost insurmountable," Ismail told us after the viewing. "They're outmanned, outgunned, and they're putting themselves in the line of fire. As long as there are elephants, these rangers will just keep on doing it." The Here Be Dragons team accompanied the rangers on their patrols for three weeks to create the film, but we never see the filmmakers behind the cameras. Instead Bigelow and Ismail chose to give the soldiers the 360-degree cameras to carry around wherever they chose, encouraging them to confide how it felt to live in constant danger from attack and show off their everyday lives at home. Eventually, Ismail said, the soldiers felt comfortable enough that they revealed more to the cameras "than to their families or fellow rangers" about their fears and beliefs. One ranger placed the 360-degree camera in the town square and let his children play ring-around-the-rosy in front of it. As the ranger packs, he says that if he dies on patrol, he knows that his family will be proud of him. In another scene, the rangers come across the rotting carcass of an elephant, its entire face cut away to extract the ivory. One ranger with thirty years of service remarks that when he finds an elephant he failed to save, he "feels like they have killed my child." The film focused its narrative around the stories of three rangers in particular, asking what drives these men to stay in such dangerous jobs. "They're heroes, but that's a multifaceted thing," said Ismail. "Are they doing it for their families? For pride or honor? Or just for the money? We tried to honor that." Inside the doc in VR, you're mostly at eye level, seeing what the rangers see as they stalk through ten-foot tall elephant grass, unable to make out if anyone is lying in wait for them. The stress was palpable even while remembering I was in virtual reality. For Ismail, who accompanied their patrols, "any little innocent sound became terrifying." And while Ismail's crew finished their tour after those three weeks, rangers can average ten to twenty years of service in those conditions. Kathryn Bigelow first tackled the topic of the ivory trade with Last Days, an animated short film that controversially explored "the intersection between poaching and terrorism." She then decided to focus less on ivory demand and "look more at the supply side" at how to protect the elephants, leading to the conception of The Protectors. Once she and Ismail teamed up to plan out the film, they decided to focus on how to "activate the audience" with a "call to action." People can read articles about these issues or view still images, but they hoped inserting viewers into the rangers' visceral, intimate experiences would push viewers past empty sympathy into actively supporting their cause. African Parks director Andrea Heydlauff noted that the rangers are at the "front line" of a never-ending "poaching war". A few months without an elephant death is a major victory. Worst case scenario, elephants become extinct within ten years. Bigelow asked Clinton if the American military could step in or train soldiers. The response: this would cause more problems than it would solve, with Clinton suggesting people go to the African Parks website to donate better equipment to the rangers, and prevent the "horrific slaughter from continuing". Before Ismail joined forces with Bigelow on The Protectors, he directed a similar VR film called The Displaced, which tells the story of three refugee children in Sudan, Ukraine and Syria. Rather than narrate the struggles of the children or focus on the politics, the film allows the children to highlight their concerns, struggles, and hopes for themselves. You have the context of seeing the war-torn landscapes around you, as the film lets you enjoy one-on-one conversations with these children with no narrative hand-holding. When preparing to shoot VR narratives, Ismail focuses on not being the "stupid Americans" that don't know what they're doing. Instead, he does his best to "make friends" with his subjects, learning how to "operate within their environment, and slowly learn their stories." So when the actual VR film is shot, we feel a comfortable camaraderie with the people in the film because Ismail has already established the trust between himself, the subject, and the all-seeing 360 camera. The Displaced proved popular enough with audiences to receive two Emmy nominations and a Cannes Lion award, perhaps in part because one million free Google Cardboards were sent to New York Times subscribers to encourage them to watch the film. Ismail is only one of dozens of filmmakers working for or partnered with Here Be Dragons. Many of their films don't focus on journalism but all of their films seem to share a singular focus on connecting the viewer's emotions and thoughts to the world they are creating and the peoples who inhabit it. Dragons CEO Patrick Milling Smith, in a Techcrunch interview, claimed that his "creatively driven company" outshines other VR companies that are "probably more interested in tech demos than storytelling." Of course, other VR companies certainly focus on storytelling, and Here Be Dragons has done its fair share of tech demos, including a 5-minute VR recreation of the opening to Ghost in the Shell. But working with talented people like Bigelow and Ismail is part of what drives the studio's success, as they tap the potential for VR to augment powerful stories with emotional weight. The Last Goodbye, a Holocaust survivor's final trip to the Nazi concentration camp where his family died, does just that. Created by Gabo Arora and Ari Palitz, the film places you intimately close to survivor Pinchas Gutter as he wrestles with the suffering he's gone through. And because of that lack of distance between the two of you, it's impossible to come out of the experience without shedding some tears. Even Tree, a film in which you live the life of a literal faceless tree with arms for branches and roots for legs, helps you to kind of anthropomorphize, embracing trees and their beauty. The creators developed the film as a way to address the problems of deforestation and climate change, and it certainly feels easier to care about these issues after you've spent some time emotionally connecting to your tree self. Environmental or political activism is sometimes treated with skepticism or fatalism; problems either aren't serious enough to worry about or they're too big to solve and therefore OK to ignore. But virtual reality, as conceived by the filmmakers at Here Be Dragons, appears to be the perfect medium to dive past those preconceived attitudes and make viewers empathise with the suffering of others. The presence of celebrity support from people like Hillary Clinton, Hollywood talent behind the cameras and a boost from festivals like Tribeca shows that VR may soon achieve enough legitimacy and mainstream appeal to reach and change the lives of even larger audiences than ever before.